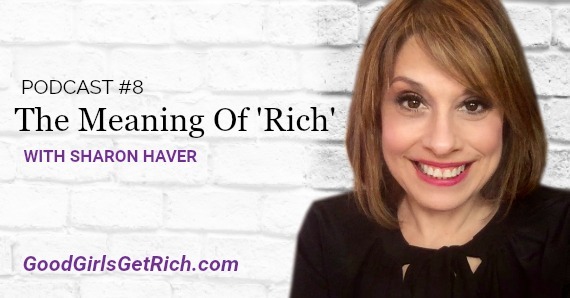 This week, Good Girls Get Rich features guest, Sharon Haver. Sharon’s family background, family’s financial status when she was young and the lifestyle she grew up with which her mother chose for her. Analogy between off-price retail store Loehmann’s and her belief that you can afford what you want to afford. Karen relates how Sharon grew up just like CNBC’s Karen Finerman, who said that she was raised as “Calvinist” basically saying that her mother bought her girls Calvin Klein clothes because she wanted that to be all they knew so that when they were out on their own and they were on college they will have to earn enough money to pay for the lifestyle that they were accustomed to. You have a lot of opportunities because you know how to best position yourself online. Perception is key. It’s like how you are perceived by the people you want to attract. And it’s something that you can totally engineer.